GET SET FOR YOUR FESTIVAL! It's festival time, and as all the fashion blogs seem to be doing their own 'what to wear' posts I thought I'd share some of my (limited) wisdom too. 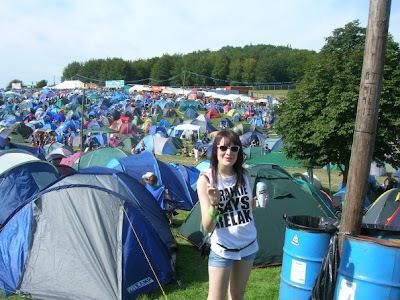 My festival look for Leeds fest 07 comprised of a customised 'Frankie says relax' tee and a pair of £4 faux Raybans. It prompted a friend to comment on a picture of him & me post fest saying we looked like a washed up 80s pop duo. Ha! 1. You live in the UK, of course it's going to rain. We all have these romantic notions of sipping cider in the sunshine, but this is far from the reality unless you get lucky. Pack a mac or live to regret it. 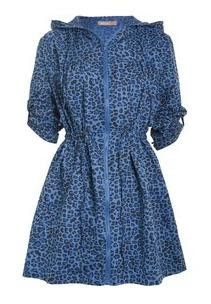 A printed mac like this one, £25 from Awear, will brighten the mood when the weather is drab. Also handy for smuggling booze into the arena, just shove up your pac a mac and no-one will have a clue. 2. Anyone who has camped before knows that at night time it is soooo cold. Prepare to freeze. Booze will help numb the cold but I would also recommend a massive hoodie, long knee high wool socks (attractive) and some tracksuit bottoms or something warm to snuggle up in. On the nights when you aren't drunk you will be glad of these! 3. For the days when you feel like dressing up, pick some fun, outlandish accessorize to adapt your look. 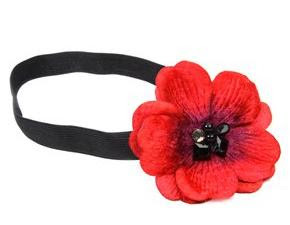 I love this asos velvet flower headband, £4, great for drawing attention away from a bad hair day in style. 4. Take wellies with you! I have a pair of the standard countryfolk green wellies which do the job nicely. I'm not really keen on novelty wellies unless you can get your hands on a pair of the reptile effect Jimmy Choo for Hunter wellies which are just gorgeous. 5. Finally I can't say it will make toilet trips easy, but the playsuit is the major trend of the season and will work well with wellies, leather/denim jackets or a pack a mac for daywear. I love this ditzy floral number from Asos because it's a total bargain, down to £14 in the sale and because it's colourful print will hide the general festival filth your clothes will no doubt accumulate. I final tip- pack suncream! I may sound like your mother but I got a burnt back at Leeds fest and it wasn't pretty!